To Cite: Salehi M, Najafi S. Prevalence of Hepatitis B Surface Antigen Among People Attending Medical Diagnostic Laboratories in Neyshabur, Northeast of Iran, During Years 2011 to 2015, Arch Pediatr Infect Dis. 2017 ; 5(4):e61633. doi: 10.5812/pedinfect.61633. Background: Hepatitis B Virus (HBV) infection remains a public health and health care issue in Iran. Since the data on its outbreak is required for effectual policies, this epidemiological study was performed on population from Neyshabur, where there has been no former epidemiological information. Objectives: This study aimed at investigating the epidemiology of hepatitis B surface antigen among subjects from Neyshabur, from year 2011 to 2015. Methods: The researchers established this study from data collected from a surveillance system. Screening tests were carried out by the Chemioluminsance method. Age, gender, referral year and month were the investigated variables. Data were analyzed by the SPSS-20 software. Results: The prevalence of HBsAg in Neyshabur was 4.11%. In the age group of more than 40 years (1.87%) and females (2.2%) had significantly (P < 0.0001) higher rates of HBV seropositivity. Also the year 2011 (5.26%) and the month of July (0.48%) had the highest prevalence. Conclusions: Hepatitis B Virus (HBV) infection rate was seemingly high in Neyshabur, even higher than other parts of Iran. An immunization program should be continued progressively for high-risk areas, especially the Neyshabur city of Iran. Copyright © 2017, Archives of Pediatric Infectious Diseases. This is an open-access article distributed under the terms of the Creative Commons Attribution-NonCommercial 4.0 International License (http://creativecommons.org/licenses/by-nc/4.0/) which permits copy and redistribute the material just in noncommercial usages, provided the original work is properly cited. One of the major causes of liver disease in the world is Hepatitis B virus (HBV) infection (1). The prevalence of hepatitis B worldwide is 5%, with 80% living in Asia (2, 3). Middle Eastern countries are mesoendemic with an infection rate of 2% to 7% (4). According to the world health organization (WHO) report, currently 2 billion people have HBV infection and acute infection has turned to chronic infection in more than 350 million people. Annually, it has been estimated that more than 500000 deaths occur due to hepatocellular carcinoma (HCC) and cirrhosis caused by chronic HBV infection (1, 5). In Iran, almost 46% of HCC and 51% of cirrhosis are related to HBV (6). Also, 70% to 80% of chronic hepatitis in Iran is related to HBV (7). For HBV transmission, blood and blood products are the principal route (6). In a comprehensive epidemiological study from Iran, HBV prevalence was reported as 1.07% in Shiraz to 8.96% in Toicerkan. The province’s outbreak ranged from 1.7% to 5% in Fars and Sistan and Baluchestan, respectively. In Tehran, HBV prevalence was 3.6% and 1.6% for males and females, respectively (8). In a systematic review of the literature, Alavian et al. (2008) indicated the seroepidemiology of HBV infection in the general population of Iran by extraction from the surveillance system. Based on their findings, the prevalence was estimated as 2.14% for only 7 provinces (9). Also, the prevalence of Hepatitis B surface antigen (HBsAg) in Sistan and Baluchistan was 3.38%, and the same went for Kermanshah 0.77%, Ravansar 1.66%, Sanghar 1%, Kangavar 3.79%, Dalahou 1.66%, Islam Abad 0.62%, Baneh 2.06%, Saghez 1.4%, Sar Abad 2.13%, Sanandaj 0.67%, and Ghorveh 2.13% (10-12). In a study from the great Khorasan province (including North, South and Razavi Khorasan), hepatitis B prevalence was 3.6% (13). Neyshabur (coordinates: 36°12'48″N 58°47′45″E) is a city in the Razavi Khorasan province, located in the north east of Iran, and has an area of 6753.95 km2 and a population of 433105 with elevation of 1250 m (4,100 ft) (14). Monitoring seroepidemiology is vital because it may facilitate the final eradication of HBV infection (15). Since the data on its outbreak in the general population is required for the formulation of effectual policies, this epidemiological study was performed on a population from Neyshabur, where there has been no former data on the prevalence of HBV. Also, Razavi Khorasan province is of great importance because of a common border with Afghanistan (where the prevalence is 6.5%), which is hyperendemic area for HBV infection (16). The current study aimed at investigating the epidemiology of HBsAg among people in Neyshabur from year 2011 to 2015. An epidemiological survey was carried out in Neyshabur between years 2011 and 2015 to determine the prevalence of HBsAg Infection. The researchers established the prevalence of HBV infection from data extracted from a surveillance system, during years 2011 to 2015. Thus, there was no sample selection and questionnaire and the variables were age, gender, and year and month of referral. The sample of the study was a biased sample and laboratories were selected for inclusion in the study. Overall, participants were referred due to pregnancy screening, checkup, personal or family history of HBV, check-up for visa applications, operation and having high-risk behavior like tattooing or needling. The personal data of participants were confidential. Serological samples were tested with a HBsAg Kit (Diasorin) and by a Chemioluminsance method (Germany) that had a diagnostic sensitivity of 100% (95% confidence level of 99.3% to 100%) and diagnostic specificity of 99.55% (95% confidence level of 99.32% to 99.71%). Any titer above 10 units was considered positive for HBsAg and reported as qualitative values. The SPSS version 20 software was used for data analysis (IBM SPSS statistics for windows, version 20, Armonk, NY, IBM Corp.) by chi-square test and P values of < 0.05 were considered significant. Approval for this study was obtained from the research and technology deputy of ACECR, Mashhad branch. The number of subjects during the 5 years of this study was 28685. According to gender, from 28685 subjects, 6213 (21.7%) were male and 22472 (78.3%) were female. subjects mean age (mean age ± standard deviation) was 32.2 ± 12.86 years, which ranged from < 1 to 95 years. Overall, according to Chemioluminsance results, 1181 (4.11%) cases had evidence of HBsAg. The demographic characteristics of the subjects are displayed in Table 1. As indicated, 20 to 29 years was the most frequent age group and age of more than 40 years was the major risk factor for infection with odds ratio of 10.901 (95% CL: 7.223 to 16.453) followed by the age of 30 to 39 years (OR: 4.853, 95% CL: 3.202 to 7.357), gender (OR: 3.34, 95% CL: 2.966 to 3.756) and the age of 20 to 29 (OR: 2.468, CL: 1.622 to 3.755). Regarding age frequency distribution in the present study, it was shown that the frequency of hepatitis B increased with age so that older than 40-year-olds and the 30 to 39-year-olds had the highest rates of hepatitis B. The lowest prevalence was observed in 0 to 19-year-old subjects (0.08%). The year of 2011 (5.26%) had the highest prevalence followed by 2012 (4.23%), 2015 (4.14%), 2014 (3.77%), and 2013 (3.51%) (Table 2). Also, the month of July (0.48%) had the highest prevalence yet there was no relationship between HBV infection and the month of the year (P = 0.132) (Table 3). aP value is considered as 0.132. According to the results, the seroepidemiology of HBV infection in Neyshabur was 4.11% (1181 out of 28685), which was higher in comparison with the published literature performed in other areas of Iran, even in comparison with great Khorasan province (3.6%) and Mashhad (1%), which are nearly the size of Neyshabur city (10, 13, 17-20). According to WHO and results of the present study, Neyshabur is considered as a mesoendemic region (21). In this study, the correlation between demographic features including age, gender, and HBsAg infection was significant. The high prevalence of HBsAg infection that was found in this study might be due to a possible higher risk of infection in these samples, because most the cases were referred for evaluation of HBsAg by physicians. Also, most citizens of Neyshabur have migrated from the surrounding villages and countries, especially Afghanistan, which has encountered less attention culturally. Neyshabur has 175 villages and is the second overcrowded city in Razavi Khorasan. According to statistical analysis, both age and gender play an important role in HBV infection, so that older and female subjects had higher probability of HBV seropositivity. The incidences of risk factors, such as the frequency of sexual relations in people who have different sexual partners, hospitalization, tattoo, and blood transfusion increase with age and subsequently the likelihood of infection will also increase. As it was shown in Table 1, according to age, the age group of more than 40 years (1.87%) showed significantly higher rate of HBV seropositivity, which is similar to other reports (20). Despite the high prevalence of HBV in males in some reports, the current findings revealed that females (2.2%) had significantly higher rates of HBV seropositivity (18, 22, 23). The higher positive incidence in females may relate to the sample size that was over three times more than that of the male sample (6213 vs. 22472) and, as the participants were referred by physicians, they were at a high risk for infection. Thus, a greater sample size would result in a higher infection prevalence. On the other hand, females pay attention to their wellbeing more than males and more commonly refer to the laboratory for pregnancy screening. According to Mohebbi et al., 0.7% of pregnant females in Lorestan were positive for HBs-Ag (24). The lowest prevalence according to age was related to younger age; reduced HBsAg prevalence in this group was strongly associated with vaccination among younger people. In Iran, vaccination of newborns from 1993 onwards has been the most significant between all measures for controlling HBV and through the national immunization program, people less than 24 years old must have received HBV vaccine. The prevalence surveyed in the present study was similar to studies carried out in cities and countries, so that, HBV prevalence in the study of Merat et al. regarding province of Golestan was 5.1% (25). Ziaee et al. determined the prevalence of HDV infection among chronic hepatitis B in Birjand and there was an HDV infection rate of 3.1% (26). A long-term protection against HBV for more than 20 years was illustrated by Saffar et al. 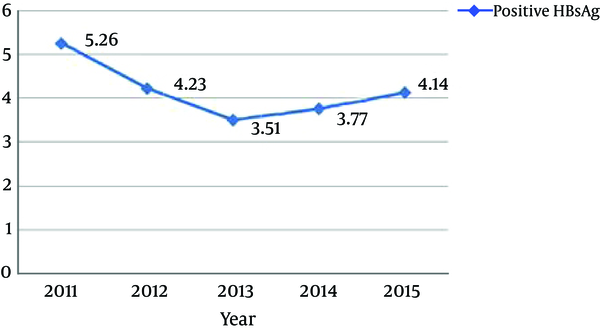 among neonates, who were immunized against HBV and it was very effective in decreasing chronic HBV infection prevalence in young adults, who were vaccinated in Iran. However, the continuity of protection presented by preliminary vaccination remained unknown (27). The adjusted seroprevalence of HBsAg in South Korea in 2009 was 4%, which was in agreement with the current study (15). 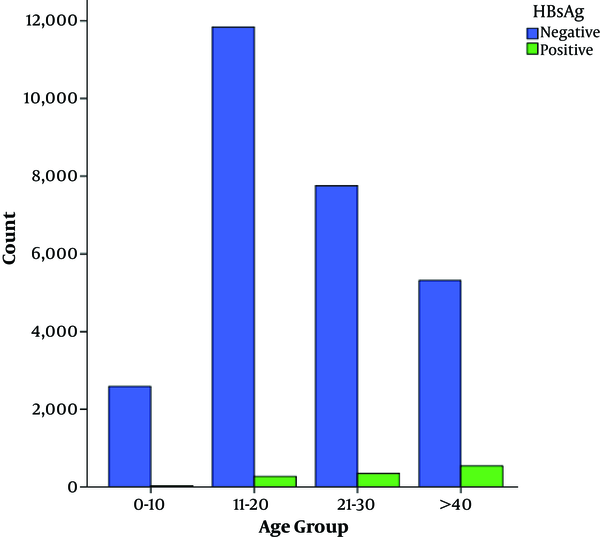 The prevalence of HBsAg in young adults in Banjarmasin, Indonesia was 4.6% (28). Recently a report indicated that a low dose of RPB5-mediating protein (RMP) could inhibit HBV transcription and replication (29). A comprehensive study in Singapore showed that the prevalence of hepatitis B surface antigen (HBsAg) was 3.6% in 2010 (30). Mahabadi et al. screened chronic HBV patients, who did not receive any antiviral treatments and then attempted to determine hepatitis B virus reverse transcriptase (RT) protein variations among them. Their results showed that in comparison with other studies, the mutations related to drug resistance in Iranian treatment-naïve chronic HBV patients were higher. Hence, in order to attain an excellent regimen option, they suggested that chronic HBV patients should be monitored closely before the start of therapy (31). The year 2011 (5.26%) had the highest prevalence. However, the rate of HBsAg seropositivity has gradually decreased during other years. It seems that the reduction in HBsAg rate was mainly due to increased awareness among people and the national vaccination program. Also the month of July (0.48%) had the highest prevalence yet there was no relationship between HBV infection and the month of the year (P = 0.132). However, this is the first report, which considered the month variable and it’s relationship with HBV infection. Because of the absence of data on risk factors of HBV among the general population of Neyshabur, authors of this work suggest that the next study should be performed based on risk factors. In order to manage this disease and attain additional measures, more accurate epidemiological data is necessary. In conclusion, the current results confirm that the prevalence of HBsAg in Neyshabur is high, even higher than some other parts of the county. Lack of management by authorities and those, who categorize regions for hygiene policy may be the main causes of HBV infection in Neyshabur. Therefore, immunization programs should be continued progressively and further strengthened for high-risk areas, especially Neyshabur. The authors would like to thank the staff of the Mashhad academic center for education, culture and research (ACECR) laboratory in Neyshabur for their kind cooperation. This study was financially supported by research and technology deputy of ACECR, Mashhad branch (Iran). Authors’ Contribution: Somaye Najafi and Mohammad Salehi performed the study and managed the manuscript preparation; Mohammad Salehi was the advisors of this research. Implication for Health Policy/Practice/Research/Medical Education: The study results provide valuable information for policy makers and health system workers with regards to hepatitis B vaccine in high-risk areas, such as Neyshabur.